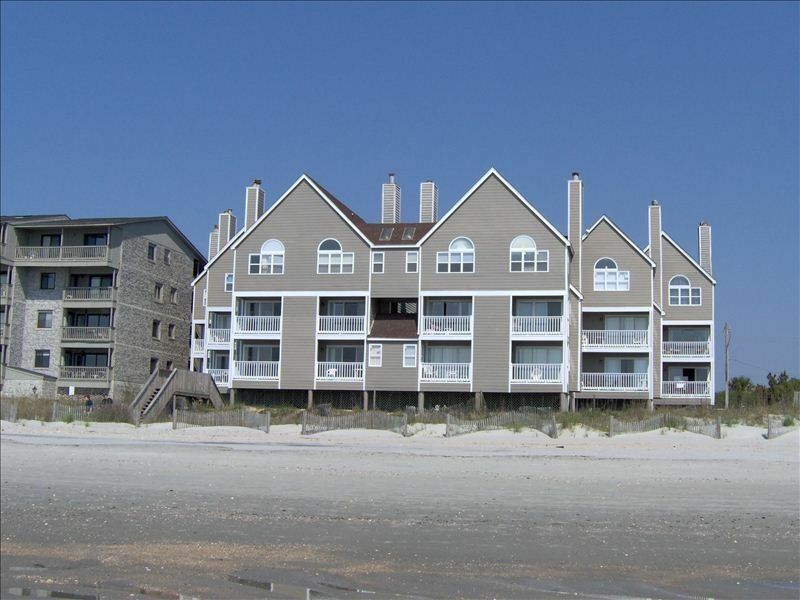 Cape Coddages II is located in Surfside Beach just seven miles south of downtown Myrtle Beach, Broadway at the Beach and the airport. Surfside is a small beach community that offers great restaurants, golf courses and shopping. We are located just minutes from the Garden City Pier and Murells Inlet. Our two bedroom, two bath home away from home is fully furnished and equipped and ready for your stay at the beach. The master bedroom has a queen size bed and private bath with a jacuzzi tub, the second bedroom also has a queen size bed and a Twin Roll Away bed. There is additional sleeping space available on the queen size sleeper sofa located in the living room. Pillows, blankets and comforters are provided (linens are available upon request for an additional charge). Towels are not provided. Washer and Dryer is provided in the unit for your convenience. There are 2 reserved parking spaces. Space is limited so no boats, trailers,or campers are allowed. We enjoyed our week at the condo very much. It was clean and adequately stocked with enough dishes and cutlery etc. it was nice to watch the kids on the beach from the balcony and the pool was big enough. Getting our SUV out of the designated parking area and out the complex was a bit of a challenge but we had a great time. We hope to be back next year. We loved it! Location couldn't have been better! Condo was clean, beds were comfortable, kitchen offered lots of items. We had a great week, thanks for share your home with us! Loved the place. Perfect for us. Parking a bit of a challenge. This condo was located to the left of the building, which caused ocean views to be somewhat limited. The picture on this site (of the condo from the beach) doesn't show that there is a house on the right of it which causes again the view to be limited. The parking for this unit was by far my biggest complaint. We had to fit our large SUV through a small opening and squeeze it into a very tight parking space. It was a challenged to get our vehicle in and out of the space. The beds were also very uncomfortable. However, it was nicely decorated, and very clean, I also enjoyed the fact that alL the beach chairs, toys, etc. were kept in a storage area downstairs, that was convenient. Overall we had a nice trip, but I would not recommend this condo to anyone with large vehicles. This was our second visit to Cape Coddages II over the past three years. We have a family of 5 and this condo fits us perfectly. Plenty of room, very clean and beautiful view from the balcony of the ocean. Loved hearing and seeing the ocean waves coming in at the beginning and end of each day. The beach was not crowded like Myrtle and we spent a lot of time boogie boarding and just relaxing on the beach. Our three young kids also loved the pool to cool off a bit after spending most of the day in the sauna like ocean. We spent part of one day at Murrell's Inlet and went out on the ocean on wave runners - that was a blast. Plenty of great places to eat and a great ice cream parlor via 10 minute walk up the beach. We also strongly recommend an easy 2 hr drive to historic Charleston with many things to see and do - beautiful city. Maureen is wonderful to deal with and made our stay at her beach front home easy. We wanted a place to forget about our very busy lives and this vacation could not have been better! We'll be back! This unit is perfect if you want to be steps from the beach! The beach access is right next door. Our four year old loved having an option of going to the beach or to the pool. It is so wonderful to have access to the storage unit downstairs to keep all the beach gear and fishing poles and not have to bring them up stairs or in the unit! The unit is clean, nicely decorated and very comfortable. Surfside is very family friendly. It is quiet but close enough to Myrtle Beach to where you can drive and have tons of things to do. We are already planning our vacation for next year. Maureen is very accomodating and wonderful to work with! LINENS CAN BE PROVIDED FOR AN EXTRA FEE.